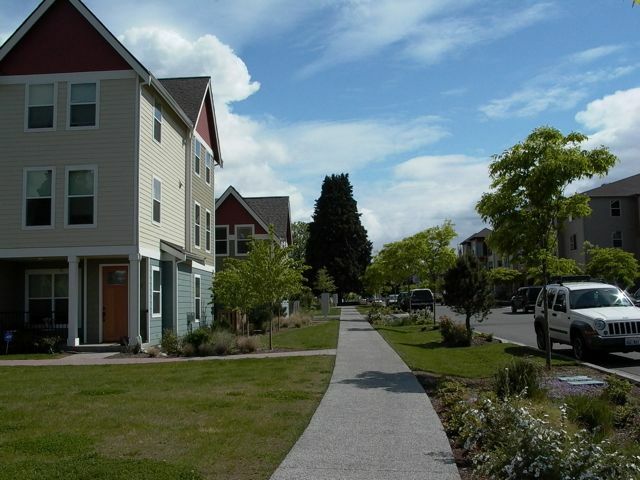 Permeable portland cement concrete (PCC) in a residential setting. These limitations are due to the fact that in order to allow water to pass through, permeable pavements are not designed with the structural capacity to support heavy loads (Pennsylvania Stormwater Management Manual, 2005). The appearance of porous asphalt is much the same as non-porous asphalt. Porous concrete. Note the rough texture. 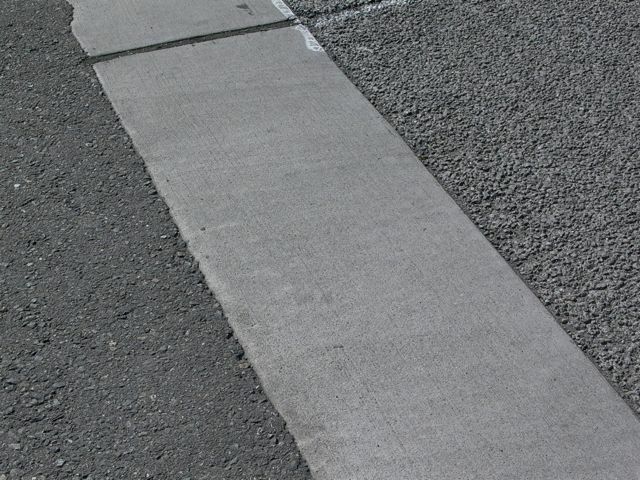 Porous concrete, much like porous asphalt, has the fines removed in order to create voids. It was also developed in the 70s. Portland cement concrete (PCC) is typically made with coarse aggregate (gravel), fine aggregate (sand), water, cement, and optional additives. 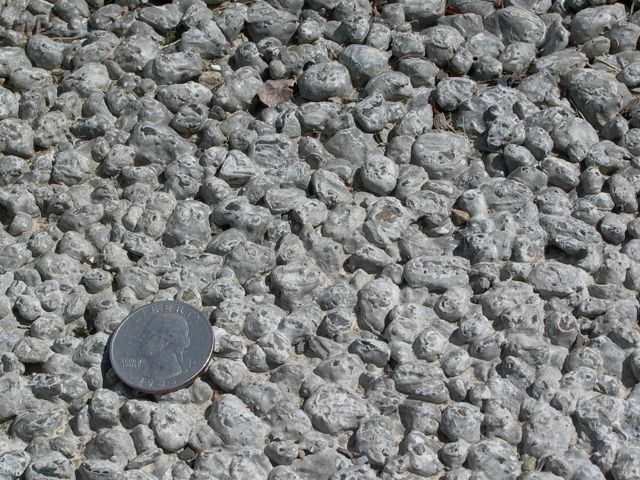 In pervious concrete, the fines are greatly reduced or entirely removed. 15-25% void spaces may be achieved, with an average flow rate of around 480 in/hr. (Hun-Dorris, 2005) The appearance of porous PCC is generally rougher than nonporous. Finishing during the construction process may create an impervious layer on the surface and attention needs to be paid to the process to prevent this from happening. Permeable concrete pavers are simple to install and drain well. Concrete blocks also have a pleasant appearance. A variety of permeable pavers, bricks, and non-porous HMA. 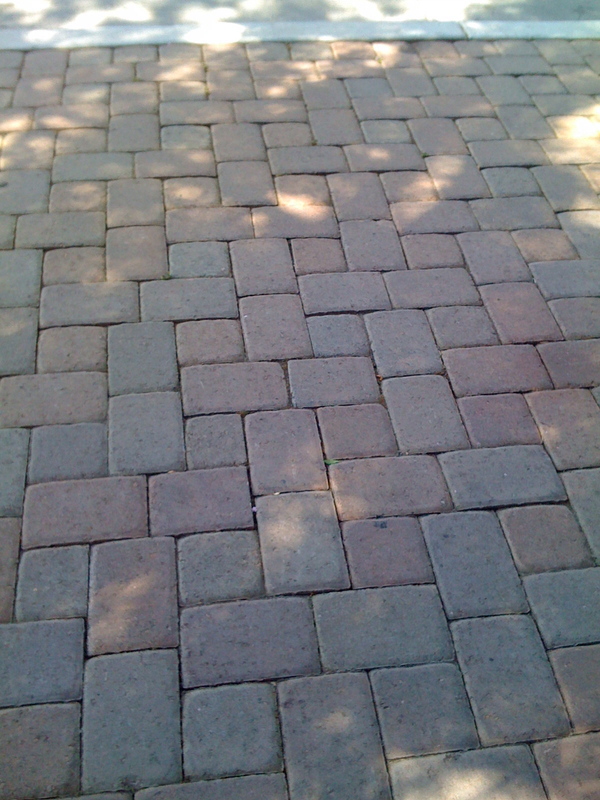 Paver blocks are typically used in low traffic areas, such as walking paths or driveways. 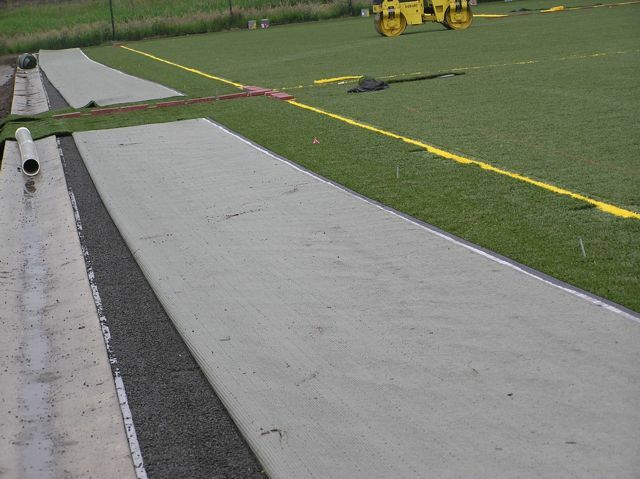 Reinforced turf in usually used in pedestrian walkways, emergency access lanes, trails, and auxiliary parking. Other permeable pavements include decks, open graded aggregates, and soft paving materials such as wood mulch. Decks allow for ease of walking through swampy or sandy areas while creating very low-environmental-impact structures. Wooden structures are also natural looking and aesthetically pleasing. 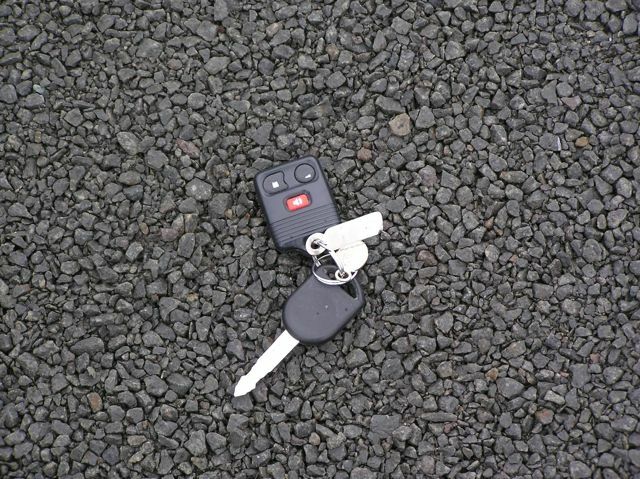 Washed aggregate base with keys for scale. 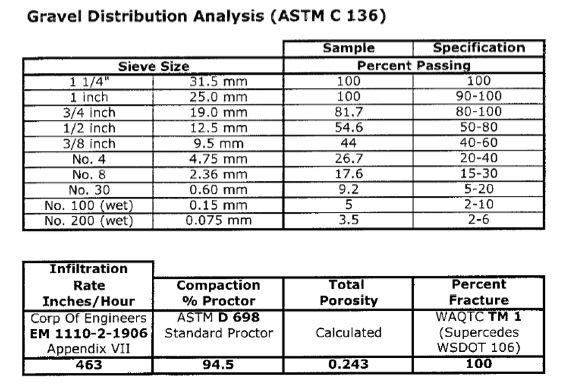 Open-graded aggregate demonstrating high rates of permeability. Open-graded aggregate is washed to remove fines and is typically made of single-sized, angular pieces. This allows for low settling compaction, and void spaces may constitute up to 40% of the material. Open-graded aggregate is extremely permeable. This kind of base has a strong tendency to segregate and steps must be taken through production, transport, and placement to offset this tendency. Regularly wetting the stone through the laydown and compaction processes keeps the material more stable. Soft paving materials, such as wood mulch and crushed shells, are typically used for foot traffic. High void spaces allow for good permeability, and such materials tend to offer great aesthetic benefits. Artificial turf is typically the topmost layer one or more other permeable layers, such as open graded aggregate. 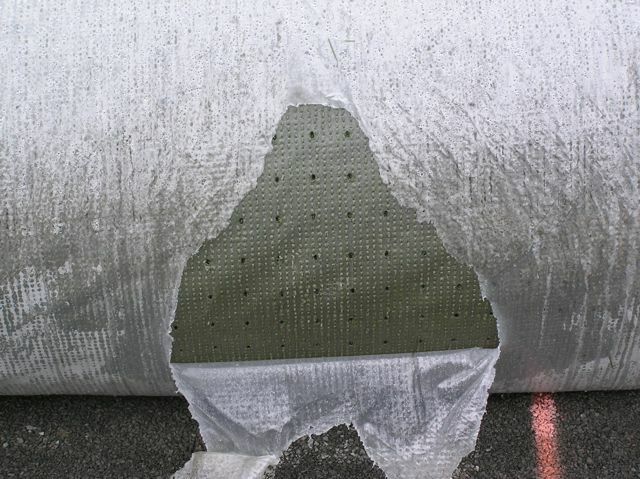 Artificial turf is rolled out in large sheets (see following photos) and pinned to the underlayer. The seams between lengths of turf are stitched. Artificial turf typically lasts for 12 to 15 years. In the Seattle area, Marymoor playfield has an artificial turf surface over 6 inches of open graded base and a 2 inch thick layer of open graded top course. 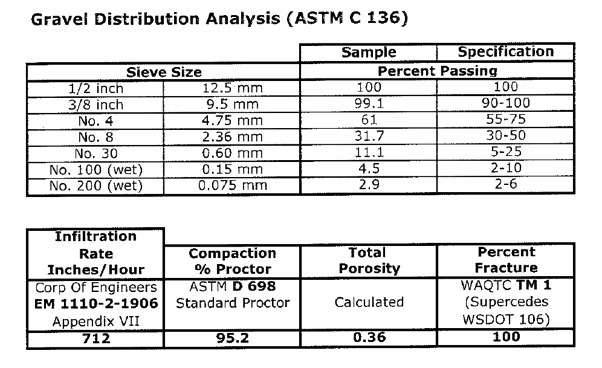 The gravel distribution analysis tables are among the images below. 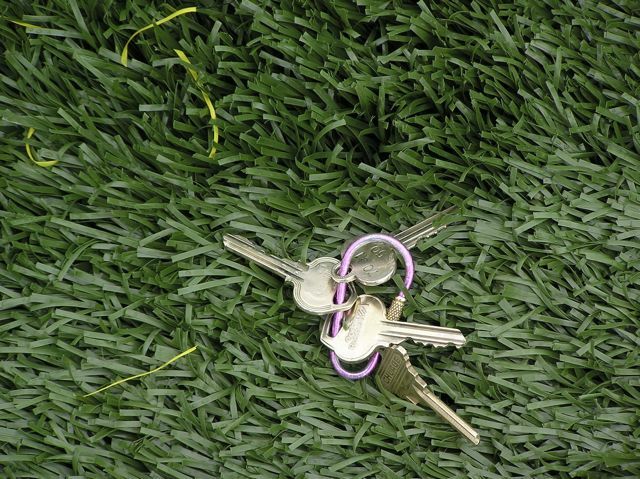 Permeable artificial turf (photo of the Marymoor playfield, with keys for scale.) This material is typically laid over a base of washed open-graded aggregate. Base of permeable turf, showing drainage holes. Permeable top stone from Glacier NW, product #8572, comprised of stone from the White River Quarry. Permeable base stone, Glacier NW product #8554, again stone from White River. Permeable soccer field – artificial turf over open-graded aggregate. Porous Asphalt, with additives, is generally 10% to 20% higher in cost than standard asphalt on a unit area basis. Porous Concrete as a material is generally more expensive than asphalt and requires more labor and experience for installation due to specific material constraints. Porous Paver Blocks vary in cost depending on type and manufacturer. 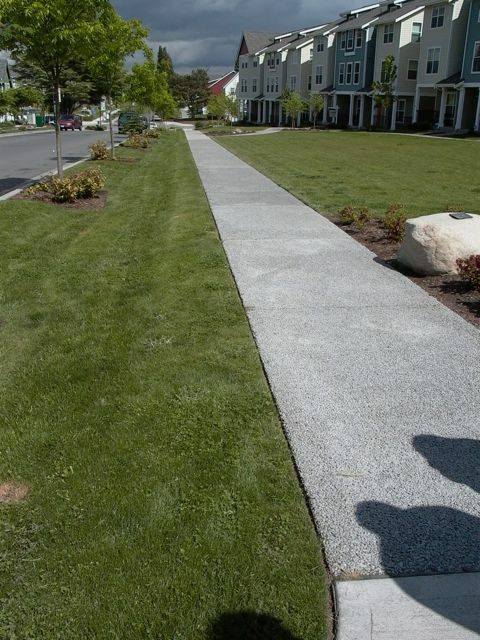 Pervious portland cement concrete walkway. The design of permeable pavements varies considerably due to location and cost considerations. However, three things must be considered regardless of which design is being considered: Consider the location and any unique features, local codes, etc. ; design a rigorous and correct structure; and build it properly, using best management practices widely available. 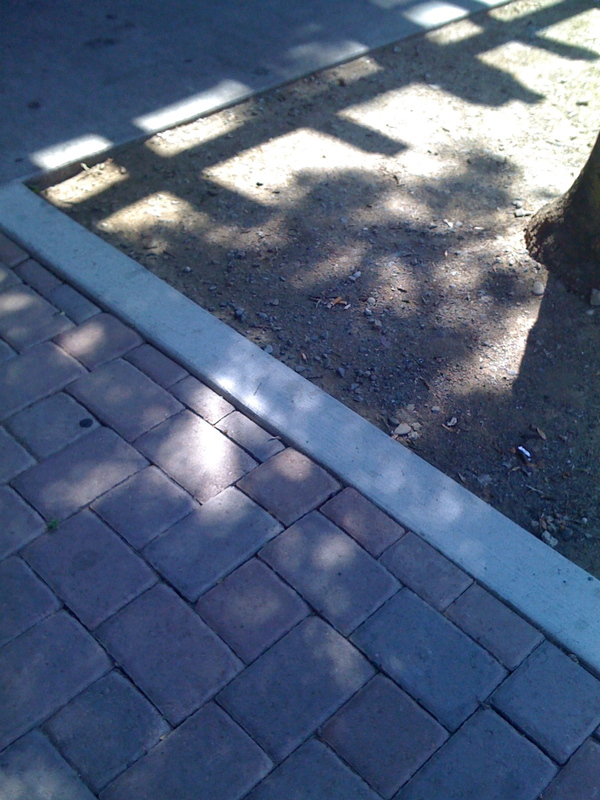 (Hun-Dorris, 2005) Note that the soil beneath the permeable pavement structure must allow the accumulated water to drain, including special attention to avoiding compaction. Care must also be taken to ensure that debris drains away from the permeable structure, in all directions, to ensure that clogging does not become a nuisance. Generally not recommended for traffic surfaces with slope >5%. Concerns for maintaining the permeable pavement are typically limited to aesthetics and the prevention/repair of clogging. 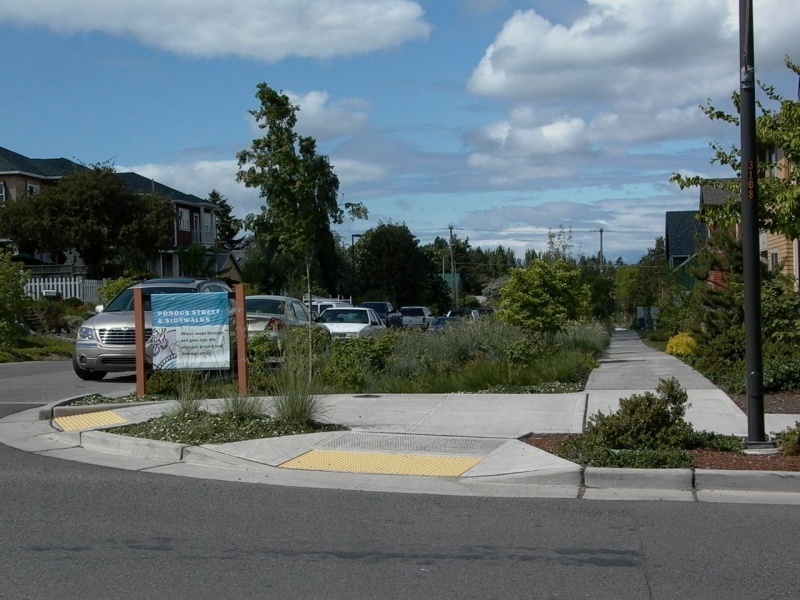 Proper design may prevent clogging, such as designing for drainage away from the porous section of pavement. This will keep debris from sweeping onto the pavement while allowing rain to infiltrate the soil below. 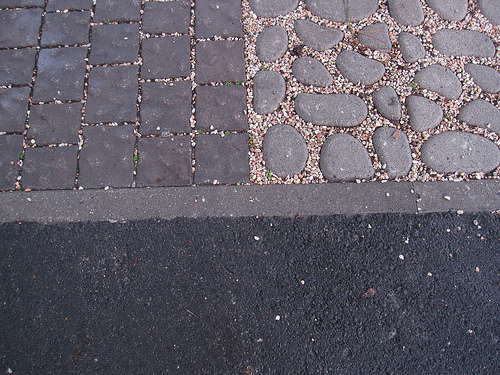 Winter maintenance for permeable pavements is simpler than that for typical pavements. Avoid using any abrasives, such as sand, on or near the porous pavement. Heat retention in the stone bed beneath the pavement tends to provide good snow melt, leading to reduced snow and ice problems. Snow plowing may be used with caution, setting the blade about an inch higher than normal. Salt may be used, however, nontoxic organic deicers are preferred, as the contaminated water will go directly to the water table. 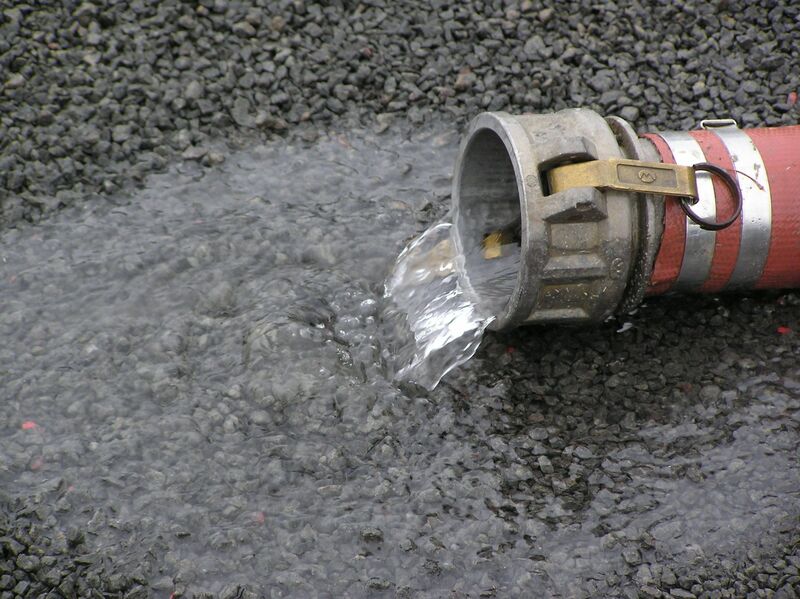 Drainage structure repair has the highest priority, in order to keep the system working as designed. Pavement structural repairs will be limited primarily to areas that have settled over soft soils. These areas may be patched with standard or permeable pavement. Potholes will rarely be a problem, due to the lack of a freeze-thaw cycle as in typical pavements. Seal coats ought not be used, as they would nullify the benefit of a permeable pavement.